My mother chose Clare as her confirmation name because she was born in a Franciscan hospital the day after Clare’s feast, and the sisters there at the time made a big deal about it. Years later, upon learning that Chiara is Italian for Clare, she suggested had she known that fact when I was born in the same Franciscan hospital, she might have named me Chiara. 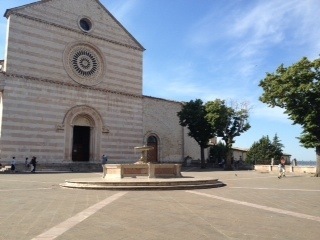 Visiting the Basilica of Santa Chiara was the first item of business when I reached Assisi. The strong fair brick building with a gracious piazza is an impressive sight, yet is often overlooked in favor of the dominating and ornate Basilica di San Francesco on the other side of the walled town. We went early, before the crowds could gather. More than a decade after my last visit I was struck again by the basilica’s simplicity. The walls are not covered with frescos and its not laden with side chapels. The floor is bright with large panels of rose and peach stone. Only in the apse does one glimpse the peeling renderings of saints that must have once adorned the nave. The basilica was nearly empty when we entered. The sign for the San Damiano chapel caught my eye so we made a hard right in that direction. Before passing the sign that read “solo per preghiera” I explained that this was the cross before which Francis had a miraculous vision telling him to rebuild the church. It says a lot about Francis that he assumed that meant a literal church and got to work shuffling stones. Of course, it’s now clear that God’s message meant for Francis to renew the universal Church, which in Francis’ time was lousy with corruption and avarice. Francis’ witness to simplicity and generosity was and remains outstandingly countercultural, and still has the power to reinvigorate. After regarding the San Damiano cross from the back of the chapel for a moment I approached the crucifix to pray. The kneeler was so close I could barely see, but I turned my eyes up and asked for whatever scraps of grace I could get. I was in the presence of something that had inspired a change in the world. I caught my breath and stood. Many of these major pilgrimage sites have stairs and doors labeled “entrata” or “uscita” in order to control the flow of traffic. We found the stairs marked “entrata” to descend to the crypt. At the bottom of the stairs is a display of relics: Clare’s robe, Francis’ tunic, Clare’s hair. I find veneration of relics comforting. They are a reminder that our bodies matter, that the flesh and blood and stuff we live with every day is just as sacred as the ephemeral. Making an about face we approached the tomb of St. Clare. She looks the same as she did last time I was here, which is much like she looked when she died in 1253. The sisters keep her body,encased in glass, in a simple room with a few bunches of flowers. As we watched from the window into the room,a heavily robed Poor Clare walked in, moved a bouquet, and replaced another. My heart rose in my chest, as it had in San Damiano. I prayed,asking for Clare’s intercession, especially for my mother. We are not supposed to believe solely because of miracles. In truth, my faith would not be shaken had Clare’s body not been miraculously preserved. But what about the other, everyday miracles? What if my mother were not who she is? What if I were not who I am? That I was loved into being is miracle enough for a thousand lifetimes. Perhaps it is through this miracle I believe. After a wander through the upper church and one more stop for prayer in the Blessed Sacrament chapel we exited into the morning sun. The gleam off the light grey stones on the piazza was harsh while the trickle of the fountain was soft in our ears, and everywhere the air smelled like flowers. This entry was posted in prayer, saints, travel. Bookmark the permalink. I love all your posts. Your writing style is superb and tells me a lot about you as a person. Of all of your posts, this one especially moved me. Perhaps it’s because one of my daughter’s names is Clare. Thank you for writing this. Thanks as always Don. Your daughter has a great name! What a beautiful story. We haven’t been there since shortly before 9-11-2001. Thank you for your kind words. I’m not an OFS, just a Franciscan aficionada. How wonderful! I feel as though I was there with you, such great writing. My daughter’s middle name is Clare, so this post will be a favourite of mine to come back and read! Relics are amazing, aren’t they. A tour of relic came to our Parish last year, and it was absolutely incredible being in the presence of so many items, I couldn’t imagine actually going to Italy, or any other town, with such Religious significance, I know I would be totally overwhelmed with emotion! Keep writing, I am really enjoying reading about this trip!